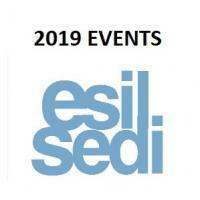 2019 ESIL EVENTS: An exciting year ahead! 2019 ESIL EVENTS An exciting year ahead! The Call for Papers is now closed. The programme and registration details will be available in due course. Some ESIL Interest Groups are arranging events on 3 April 2019. See IG pages for further details. The Call for Papers is available. Deadline for submissions: 2 December 2018. The programme is available. Registration details will be available in due course. The Call for Papers and IG Panel Proposals is available. Deadline for submissions: 31 January 2019. ESIL Interest Groups will be invited to arrange events on 12 September 2019. More events are planned for 2019, stay tuned!